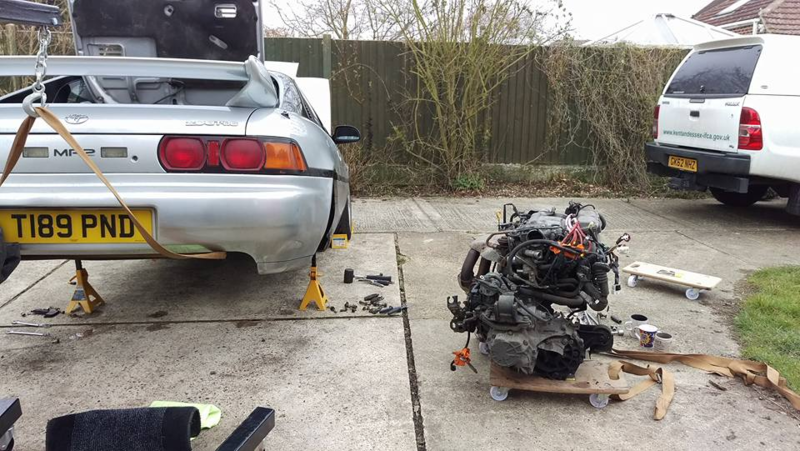 MR2 Owners Club - How straightforward is it to DIY the clutch on an SW20? How straightforward is it to DIY the clutch on an SW20? I have a intermittent low-high pitched whine which manifests itself when the clutch is depressed for more than a few seconds. I believe this is the clutch release bearing and I am pretty sure I am going to get someone to replace the clutch for me as it will likely be a lot of involved work - but I was wondering if anyone could confirm how straightforward it is to do? Re: How straightforward is it to DIY the clutch on an SW20? Very doable at home, much easier with a lift and transmission jack. I opted to get someone else to do it because I didn't fancy doing it on my back with the car on axle stands in the winter outside! I'm probably best asking around my friends for an engine lift - a few have them but if they're all in use...well, I will more likely get someone else to do it, don't much fancy a cold garage floor and the car on axle stands!! where are you located, if Midlands MRtwos does a V good job at reasonable cost. My cluch release bearing has developed the same irritating noise. It's more a PITA than a major issue and doesn't affect operation of the clutch. So I'll live with it for now and get it changed before the car comes out to play in earnest next year. Btw, If you can rev match you only need to use the clutch when starting/reversing. The rest of the time you can perform clutchless gear changes. When you get the release bearing replaced make sure you use an OEM part from Mr T.
The quality of of the item in many replacement clutch kits is less than optimal. Thanks for the advice there! It's actually worth my while going there as it's much cheaper than my local place! I spoke with MRTwos who advised that the clutch they supply has an oem release bearing, a friend of mine is going to check the clutch for me and tell me what he thinks of it. If it's on 163,000 miles, when was the last time it had a timing belt, water pump etc? Thanks for your reply Gazza_DJ! If I could get the physical dimensions of my engine, I might be able to do the timing belt, crank seals and the clutch. I have no documentation or history on the car so I have no idea when these were done last. Trouble is I have shelving (can be moved) and my motorbike (can also be moved) in my garage so space might be an issue. I also need to figure out how high I need to jack the car up as the garage is height restricted. Unless I can use a friends garage which is less height restricted! If you have no records of them being done I'd be tempted to just get the lot done and replace other seals etc while you're there if you're intending on keeping the car long term. At least then you know everything is good for a long time then! I am intending to keep it for the long term - I am a bit worried about ruining the bellhousing/spindle if I continue to drive the car on that clutch release bearing. My MR2 is my only car, so I might get the clutch done by MRTwos to negate potential damage and then do the other bits over the Christmas period with the engine out. I'll measure everything this morning to find out if getting the engine out in my garage is feasible or not. Usually there's no need to drop the engine for just timing stuff, that can all be done without doing that. Fiddly though! I must admit, I don't much fancy dropping the engine twice! I've looked at the garage and I've got more than enough roof space to get the whole back of the car up, but I don't have any lifting equipment capable of lifting the car high enough up to get the engine out which means extra £££s to buy it, my trolley jack I wouldn't even trust as it's definitely got bad seals and it's working height is not very good. So with that in mind, I think I might save some money and get the clutch done professionally. It wasn't so bad today, could just be a dry clutch and it's not slipping yet (then, it will definitely need doing!). On a separate note I do still need to get the brake & clutch fluid bled and replaced and get the gearbox oil replaced as I don't know when these were last done. I'm hoping that the gearbox oil replacement isn't an engine out job. The timing belt I'll also put some money aside for, I want to do the water pump, thermostat and timing belt along with all the rollers. Water pumps never do great after being disturbed by a timing belt change. Gear oil replacement is nice and easy, a fluid pump of some sort makes it even easier. If it makes it any easier I use a piece of old carpet to pull engine from under car once dropped. Less height involved and tools required. I’d still be tempted to do all jobs at once and drop engine & drivetrain together. Far less hassle in the long run. Just need to be organised and have experienced help on hand.